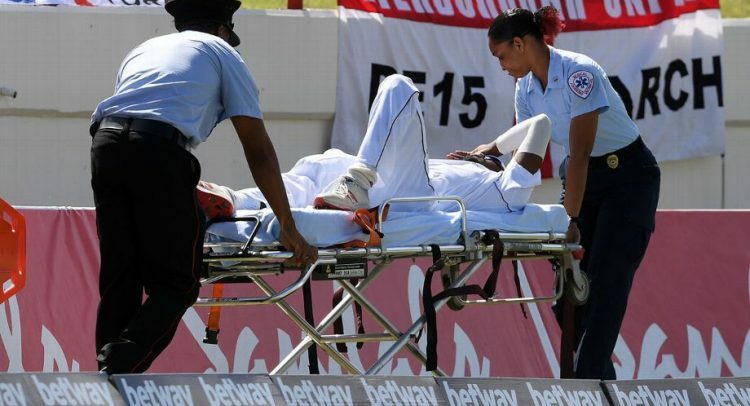 West Indies suffered a significant injury blow on the third morning of the third Test in St Lucia, when Keemo Paul, their impressive young allrounder, had to be stretchered from the field after damaging his right quadriceps. The incident occurred in the fourth over of the morning, when Paul set off in pursuit of a Joe Denly cover-drive off Shannon Gabriel. After initially sprinting at full tilt, Paul pulled up suddenly ten metres from the rope, and fell to the ground as soon as he had left the field of play. He continued to receive treatment behind the boundary as play continued, before being wheeled around the perimeter of the ground to sympathetic applause, and was replaced by the substitute fielder, Jomel Warrican. Neither have been ruled out from returning to action as yet, although in Paul’s case that may be optimistic. Full recoveries can take six weeks or more, which would rule him out of the one-day leg of England’s visit too. If that were the case, it would be a cruel end to a very impressive performance from Paul, who came into the St Lucia match as a replacement for West Indies’ captain, Jason Holder, following his suspension for a slow over-rate in Antigua. Paul struck with his first ball of the Test to remove Keaton Jennings in England’s first innings, en route to creditable figures of 2 for 58, and he repeated the dose with his first ball in today’s play, as Rory Burns clipped a loosener to square leg. West Indies’ injury worries may not be over just yet, with Shannon Gabriel appearing to be nursing a tight hamstring with his workload increased in his team-mate’s absence.